In a large bowl whisk together flour, sugar, baking powder, cinnamon, salt and coriander seeds. In another large bowl, whisk together all the remaining ingredients (except oil) until combined well. Stir milk mixture into flour mixture until just combined. Heat a griddle or large cast-iron pan over medium heat until hot enough to make drops of water scatter over the surface. Lightly brush the skillet with the oil. Working in batches, pour scant ¼ cup measures of batter onto griddle, forming 4-inch rounds, and cook pancakes until golden and bubbles form in them, 1 to 2 minutes on each side. Transfer pancakes when cooked to a heatproof platter and keep warm in the oven. 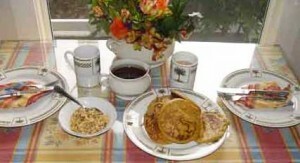 Serve pancakes with warm maple syrup and crushed walnut pieces. Serves 2. Double the recipe for 4.